Xposed is a great framework available for all android versions to allow deep system level customizations like fake locations, data restriction to various apps etc. 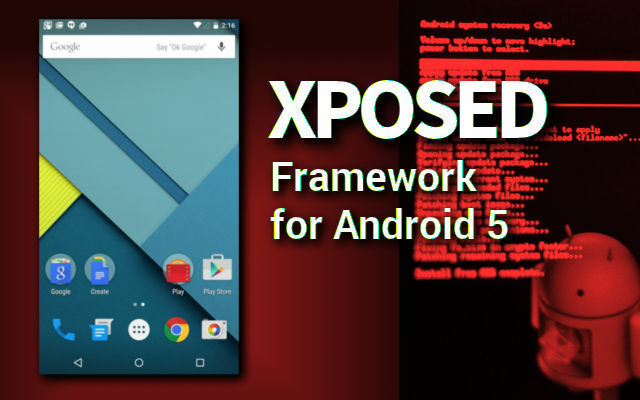 Xposed requires no flashing of any android device, but brings lot of customization and tweaks called modules that a user can install and work like apps on rooted devices. An Alpha build of the framework is now available for Android 5 Lollipop. Developer of Xposed rovo89 posted the first alpha on XDA Developers. The Current Xposed for Android 5 will only work with ARM v7 Devices. The 64BIT Intel based devices are not supported as of now. The Build is an alpha release. So it is intended for experienced people. There have been huge changes since the last stable release that need to be tested by people who know how to use a recovery, escape from boot loops and report bugs properly. :xposed-arm-20150213b.zip: Must be flashed with a custom recovery to install the framework. No, it’s not using material design yet. Yes, there are more important topics for now. XposedBridgeApi-20150213.jar: The API for module developers, in case they want to make use of some new features. Might be changed slightly until the stable release! Backups of existing files will be created automatically and could be restored later. While rovo89 says most modules designed for earlier versions of Xposed should work without any changes, some developers might need to tweak their software to work with Lollipop. Some users have reported that some modules such as Greenify, Xprivacy, or Amplify aren’t currently working with the current version, and some popular modules such as GravityBox are only partially working for now.